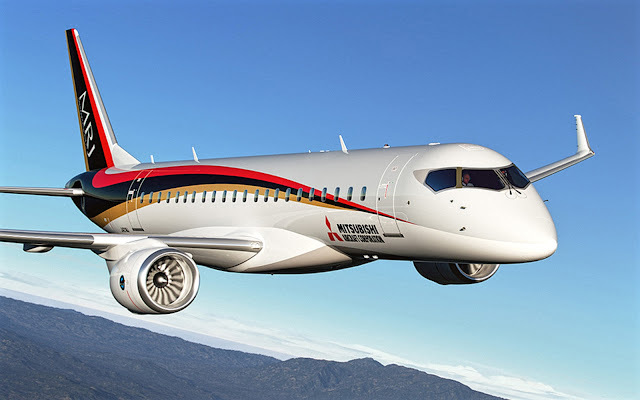 Mitsubishi Aircraft brought its third MRJ90 test aircraft to the Farnborough air show, where the type will debut on the screen on July 16. Painted in a livery of All Nippon Airways, the FTA-3 (JA23MJ) took off from the MRJ flight center in Moses Lake, in the US state of Washington, at 05:53 local time on July 9 and landed at Farnborough at 19:19 local time. En route from Moses Lake to Farnborough, the FTA-3 stopped at Bangor, in the US state of Maine, and at the Keflavík airport, which serves the Icelandic capital, Reykjavik. In June 2017, the MRJ90 debuted in Paris, where the FTA-3 appeared on a static screen after flying from Moses Lake. Mitsubishi is trying to put the MRJ90 in service with the launch operator ANA in 2020.